“Everyone seems to be going to Portugal right now,” says a recent British Telegraph article, and proceeds to list top 22 reasons why, ranging from Portugal’s gorgeous historic cities and their food, wine and nightlife, to the nation’s exquisite beaches. Bottom line: Portugal has it all, whether you want castles, history, islands or great restaurants and bars. Inexpensive public transportation means as a volunteer or intern you’ll be able to explore and enjoy many of these pleasures for less than you’d spend in most of Western Europe. As an in ELI Abroad intern in Lisbon or a volunteer in Porto, you’ll be based in one of the two central tourist destinations in Portugal. Both cities offer endless attractions, atmosphere galore and a unique culture you’ll love. During the week you’ll work at your placement, but your evenings, weekends and holidays will be full of temptations: eating out? Wine tasting? Clubs? Discovering historic medieval towns? Hiking through misty forests? Surfing? Most are easily accessible from Lisbon and Porto. 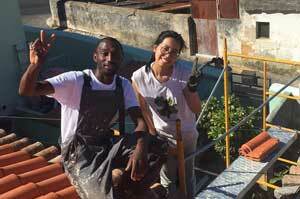 And with ELI Abroad, you’ll be enjoying this trip of a lifetime while boosting your resume and developing new skills. It’s a no brainer. Bem vindo a Portugal. Welcome. Portugal’s postcard-perfect capitol is set on seven hills along the Tagus River and it looks like something out of a fairy tale. If you like Spain or Mexico, if you love a Mediterranean vibe, you’ll feel at home in Lisbon. Learn this word: miradouros. It means “viewpoint” and Lisbon is full of them, each offering a stunning vista. Miradouros are a great way to get your bearings in the city while also enjoying its best sights. Lisbon is trams riding up narrow cobblestone streets, red tile roofs popping against the blue skies, white domed cathedrals dotting the city, and an imposing medieval castle, a Moorish fortress no less, atop a hilly perch. Lisbon is maze-like narrow streets in ancient neighborhoods; homes and churches clad in traditional azulejo tile; museums filled with art; locals relaxing in cafes and restaurants serving some of the freshest seafood you’ll ever have; clubs and bars and music venues offering one of the most vibrant nightlife scenes in Europe. A ride on the iconic yellow tram #28 offers a glimpse of some of the most popular areas of Lisbon, including Alfama, a must-see neighborhood which dates back to the 5th century and remains the least gentrified part of “old Lisbon.” Its maze of cobblestone streets and narrow alleyways make for great sightseeing, and you’ll love to lose yourself here. Alfama’s main attractions include the Sao Jorge Castle, important churches, museums, as well as many restaurants and bars. Of course, it has its own miradouros viewpoint, among the best in Lisbon. Like Alfama, Graça and São Vicente are in the older part of the city and likewise are perfect for exploring on foot. The neighborhoods are full of narrow streets, wonderful viewpoints and iconic sites such as the National Pantheon, whose distinctive white dome is often featured on photographs of the city. The city’s famous open air flea market, Feira de Ladra, is held here on Saturdays, and it’s a great place to people watch and to score some unique souvenirs. 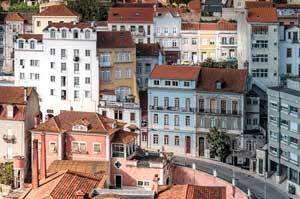 Stretching from Alfama south, the historic Mouraria neighborhood has become a popular off-the-beaten-path destination. Long a home for immigrants, this once very poor part of Lisbon is a memorable, photogenic gem that’s quickly gaining hipster cred and popularity. The Belém neighborhood along the Tagus River and to the southwest of central Lisbon, is also a can’t-miss sight. Once a major port, this riverside area attracts visitors with its restaurants, fun vibe, and the awesome monastery, Mosteiro dos Jerónimos, one of the most important historic landmarks in Lisbon. Almost next door is the free Museu Coleção Berardo, one of the most popular museums in Portugal, housing an impressive collection of contemporary and modern art, including Andy Warhol, David Hockney, Roy Lichtenstein and other masters. You’ll get magnificent river and city views on the imposing Padrão dos Descobrimentos, a huge monument honoring the golden age of Portuguese exploration in the 15th and 16th centuries. The ornate Torre de Belém is a popular destination, along with the Centro Cultural de Belém. Baixia and Rossio districts could be described as Lisbon’s downtown, an area levelled during the infamous 1755 earthquake that devastated the city, and rebuilt in the 18th century. The neighborhoods’ elegant plazas, broad avenues, restaurants, expensive shops and boutiques are all tourist magnets; be sure to stop by Livraria Bertrand, the world’s oldest bookstore. Lisbon’s hip crowd tends to hang out at the Bairro Alto, a hilly and windy neighborhood known for its rich nightlife, cafes, restaurants, tattoo parlors, clubs and music venues. This is where you go for a noisy and fun night on the town in Lisbon. Those with money tend to flock to the upmarket Príncipe Real, a trendy area whose architecture, parks, galleries and boutiques are a pleasure to discover on a leisurely stroll. You’ll find a similar vibe at the posh Avenida de Liberdade. 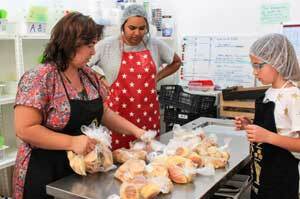 Gentrification has made the riverside Cais do Sodre neighborhood a popular place for eating out and shopping. Be sure to check out the area’s Pink Street and visit the food court at Time Out Market and the more traditional Mercado da Ribeira. This city knows how to live at night and travel-savvy visitors from all over flock to Lisbon’s music venues, wine bars, discos and bars. Some of these establishments come and go, so Google is your friend when looking for the latest hot spots -- or, better yet, ask ELI Abroad’s Lisbon coordinators. The eating scene in Lisbon is varied, exciting and -- much of the time -- inexpensive compared to most European cities. With fresh seafood, tapas, Brazilian specialties and a wide selection of international cuisine easily available throughout the city, you’ll never run out of places to eat, whether it's inexpensive basics or you want to splurge a little. No trip to Portugal is complete without trying the country’s amazing pastel de nata, the famous egg tart pastries. They're a must. 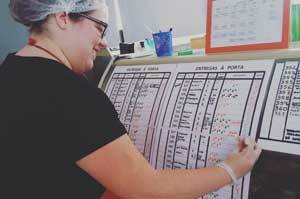 Check out the most famous pastel de nata bakery in Belém, at the world renowned Pasteis de Belém. Lisbon’s love of pastries is well known, and the city has plenty to offer in the sweets department. Wine lovers are in for a treat. Portugal’s tradition of winemaking goes back several centuries, and the country produces many varieties of distinctive wines in addition to the best known Port (or Porto) and Madeira -- fortified red wines often served as dessert of aperitif. There are many wine bars in Lisbon and very good local wineries you can tour not far from the city. Finally, there’s Fado. Fado is to Portugal what jazz is to New Orleans or flamenco to Spain -- a unique local sound that’s entered and enriched the world’s musical vocabulary. A night of Fado, good wine and food: this is simply something you must do in Lisbon. As exciting as Lisbon is, we know you’ll want to head out of town on weekends. Here are a few destinations fairly close to the city and most reachable by public transportation. * Sintra: this historic hill town in the Serra de Sintra is a great escape during the hot summer months, and as one of the prettiest destinations close to Lisbon, it’s a must-see. The Moors and Portuguese royalty built there, so the architecture, plazas and gardens are appropriately impressive. The Lonely Planet raves about the surrounding “rippling mountains, dewy forests thick with fern and lichen” that you can explore via a network of scenic hikes. * Cascais: when the beaches beckon, many Lisbon residents and tourists head to this resort built along three golden bays. Among the prettiest stretches may be Praia da Conceição.There’s a scenic marina and an historic old town; plenty of restaurants and cafes. * Obidos: this incredibly photogenic walled town, among the prettiest in Portugal, looks like a movie set and is worth seeing Be sure to try Ginja, a local cherry liqueur served in a chocolate cup. Once you've enjoyed the city, hit the beach: there are lovely ones in and around Obidos. * Fatima: the site for the famous miracle -- the Virgin Mary is said to have appeared to three shepherd children here in 1917 -- draws millions of Catholic pilgrims from all over the world, particularly in May and October. Visitors say, no matter your religious beliefs, it’s hard not to be impressed by the town, its cathedrals and its vibe. * More beaches: The shores along Lisbon are varied, and its beaches stretch along four different coastlines. There are popular beaches near the city and Ericeira to the north has some of the country’s best surfing, but for the longest stretches of sand head south to Costa da Caparica, Praia do Meco (part of which is a nudist beach,) Troia, and Praia da Adraga, considered one of the best beaches in Europe. Porto is arguably Lisbon’s closest rival for the “coolest in Europe” honors. Portugal’s second-largest city some 200 miles to the north of Lisbon, has become such a magnet for travelers that there are actually folks who discuss which is hipper. 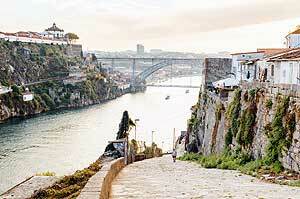 Like Lisbon, Porto is a beautiful, historical marvel, set on a hill and overlooking a river, Rio Douro. Its colorful architecture, whitewashed buildings, red tile roofs and graceful church spires look like a Hollywood movie set. But in recent years this picturesque area has also become simultaneously more industrial, its older sections revived (though many remain less gentrified than in Lisbon) and it’s become a noted leader in art, design and the culinary arts. Museums and galleries are a big draw here, and a great place to pick up some unique souvenirs. Porto’s proximity to the more remote northern areas and the natural wonders of the rugged Peneda-Gerês National Park make it an ideal destination for those who like the good life, but also want good access to nature. Also like Lisbon, you’ll find fabulous viewpoints (miradouros) which make good destinations even if you’ve already taken a zillion photos. Porto also has a few Harry Potter connections (author J.K. Rowling lived here for a while), unique sites full of character worth checking out whether or not you’re a Harry Potter fan. And yes, there are wonderful beaches. Small and compact, Porto is a walker’s dream as long as you don’t mind steep alleys and hilly streets. Its stunning riverside setting mean tour cruises along the Rio Dour and the surrounding wine country valley are among the most popular visitor activities. The heart of the city is its historic neighborhood, Ribeira, one of the oldest in Porto and a UNESCO World Heritage Site. Ribeira’s cobble-stone streets and narrow pathways, it’s colorful houses, plazas and gorgeous river views are one reason people come here -- the other is the neighborhood’s wealth of bars, restaurants and clubs. For great views, stroll across the stunning Ponte de D. Luis, or take the very cool elevator that connects the port. Check out the unusual bridge shrine and the smaller, less-well travel shrine for good luck on your trip. There are great churches and cathedrals to see here, with the magnificent 400-year old Baroque Porto Cathedral a must-see, and the Casa Museu Guerra Junquiero house museum well worth visiting. Extending from Ribeira’s you’ll find fascinating traces of Porto’s Jewish culture. Although small, Porto offers plenty of museums, and especially recommended is the impressive park and arts center of Fundação Serralves, west of Ribeira, one of the reasons why artists and art lovers come to Porto. Across the river lies the Vila Nova de Gaia, the heart of Portugal’s port wine industry. Obviously, the big reason to go there is to sample porto wines; but there are several noteworthy places to visit; there’s also very fun aerial cable car ride. 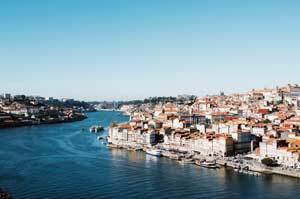 Photography nuts will appreciate the magnificent river and Porto views from Vila Nova de Gaia. Don’t fret if Porto’s signature dish -- tripe -- doesn’t float your boat. The city offers a wonderful selection of local and international cuisines, excellent budget restaurants and plenty for those willing to splurge. You won’t be bored at night, either, not with Porto’s numerous nightlife hotspots. An evening of Fado -- Portugal’s unique music, often performed in restaurants -- is something every tourist should experience at least once: it’s as unique to Portugal as samba is to Brazil or flamenco to Spain. Since this is a city that named a famous wine, obviously wine tasting -- porto and others -- is a must experience. Finally, be sure to indulge in nata pastries, a Portuguese specialty you’ll find in many Porto bakeries. Your weekends and holidays make for ideal time to explore the areas around Porto. Most of these are reachable by public transportation, making them perfect short-term getaways. * Guimarães: this ancient city, a UNESCO World Heritage Site, first settled in the 4th century, is linked to the beginnings of the nation of Portugal. The town has wonderful medieval architecture and an exceptionally well preserved historic center. * Braga: the wealth of magnificent old churches prompts some people to call Braga the “Rome of Portugal” although the city also has a fun, youthful vibe thanks to a nearby university. The iconic Bom Jesus Sanctuary is a major reason to visit Braga, and you can reach it via a funicular. * Aveiro: the canals and gondola-like river boats will instantly make you think of Venice, but this lovely city also has other things to explore, including wonderful architecture, a restored fishermen’s quarter, and some welcoming beaches. * Esposende: kick back and chill along the quiet beaches and sand dunes, and areas perfect for hiking and bird watching. This is natural escape is just half an hour’s drive from Porto. Farther north, you can indulge in outstanding seafood and while enjoying the beauty and architectural richness of Viana do Castelo. * Peneda-Gerês National Park: Portugal’s only national park boasts majestic mountains, quaint villages, and a wealth of flora and fauna. Among the must-see destinations in all of Portugal. Farther afield -- but very much worth seeing! Algarve: in a nation known for its beaches, these southern havens are among the very best. Centro: once known as Estremadura and Ribate regions, and now rebranded as Centro, this area in central Portugal is home to some of Portugal’s most important architectural marvels, including the incomparable monastery, Mosteiro da Batalha and the extraordinary royal complex at Mafra. Coimbra: home to one of the world’s oldest universities, this city in central Portugal is a mixture of contradictions. A progressive, youthful atmosphere thrives in a gorgeous, historic setting. Halfway between Lisbon and Porto, this is a trip we encourage all ELI-ers to make. Rota Vincentina trail: grab your walking shoes and set out along this amazing hiking route that hugs Portugal’s stunning south-western coast. Madeira Island: they call it “Pearl of the Atlantic” for a reason. This gorgeous island, known worldwide for its wine, is a somewhat underestimated destination worth considering. Sao Miguel, Azores: Lonely Planet calls it “The Hawaii of the mid-Atlantic,” the largest of the remote Azore islands located some thousand miles (1500 km) off the coast of Portugal. Think lush, green, exotic and very much off-the-beaten-path. Money: Portugal is in the European Union and uses the Euro. In general ELI recommends you carry little cash with you, relying mostly on ATMs and using credit or debit cards whenever possible. WiFi: While not as well connected as some European countries, there are nonetheless many places both in Lisbon and Porto that offer free wifi. Transportation: You can do most of your exploring by local transportation. Buses are usually the quickest and most convenient, even along longer routes, although there are trains in Portugal as well. Lison offers many inexpensive public transportation options, as does Porto; you can also use Uber in both cities. Shopping: Fresh markets are definitely the way to go when food shopping in either Lisbon or Porto. There’s a popular flea market in Lisbon; and a couple in Porto. Art can be a good buy in Porto. Portugal produces about half the world’s cork so it’s no surprise you’ll find a wealth of cork products -- everything from furniture to wallets and bags. Azulejo tiles and other ceramics are popular items to buy, including the colorful Rooster of Barcelos, an unofficial symbol of Portugal. And of course, many visitors buy Portuguese wines -- but note, you have to be over 21 to bring it into the US.